Some fortunate people can observe a few pieces of information and can easily envision a finished creation in extraordinary detail. Their powers of visualization are highly developed. Others struggle to visualize relationships and results and need pictures, diagrams and even solid objects in order to grasp how things might go together to create a harmonious whole. If you have ever struggled to present a new idea to a group, you have already met these people. Fortunately, technology and computers have come to the aid of those who have difficulty conceptualizing results from seemingly disrelated actions. Visualization software is used in architecture and in designing everything from cell phones to shopping centers. 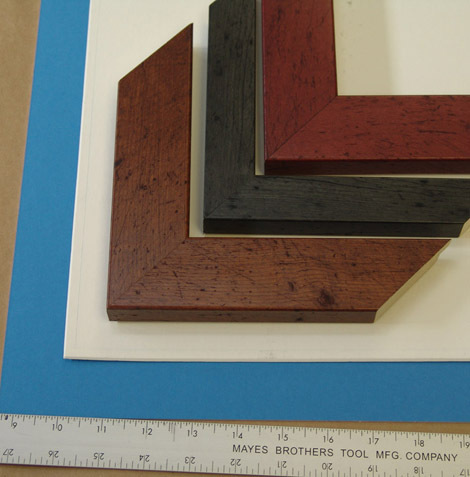 In the custom picture framing industry, there are new varieties of Visualization Software which allow us to create multiple scenarios for matting and framing an image. This software allows us to quickly explore what happens to the appearance of an image if we make changes to mat colors and dimensions and select different mouldings to frame the image. 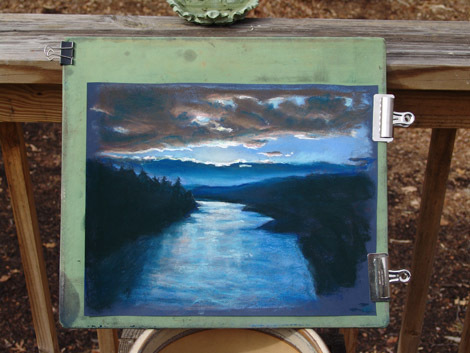 For example, some people can see an artist’s original painting as seen here and by glancing at a collection of mouldings and mats as seen in the next image, can synthesize a mental model of what will produce an acceptably dramatic presentation of the image. For the rest of humanity, it helps if we can explore various "what if" scenarios and make sure that we have considered enough options to give us peace of mind in our final decision. Computer-generated images allow us to quickly assess the effects of making changes. If we stay focused and don’t let our imaginations run away with us, we can usually generate enough different solutions to satisfy us in less than 20 minutes. Since the computer stores our choices, we can review them at our leisure and even send them to friends for comment. Some have asserted that this kind of decision-making tool extends the decision making unnecessarily. The answer is to use this kind of tool only when a client can’t visualize the finished product or is not present to assist in the decision-making. In these cases, Visualization software can save time and money. You generate a number of alternative solutions for a design problem and let the client mull them over on their own time. If you have done your work well, they will have enough alternatives to choose from and will be in control of the final result. The trick is, of course, to provide enough alternatives to choose from, but not so many that the client is overwhelmed. This takes a certain discipline, because people who are proficient with software like to show every possible alternative that can be generated. 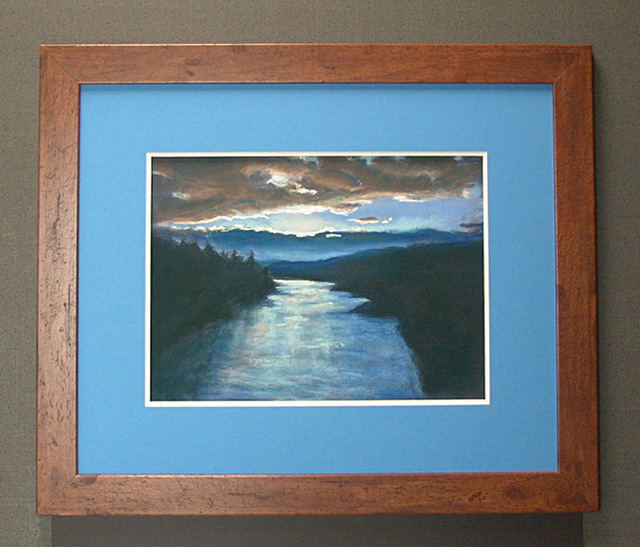 I have found that it is very easy to generate six to eight really interesting variations on almost any framing design, so I stifle this impulse if clients or spectators are present as it invariably overwhelms them and creates splitting headaches. It is far better to limit myself to presenting four alternatives or less. That seems to provide plenty of choices and is capable of being easily solved for the optimum choice. 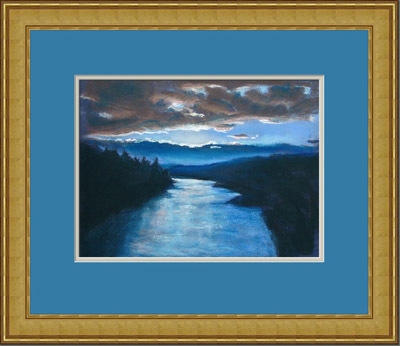 The technology is not perfect yet as the computer renditions of frames is not perfect, but if you look at the examples shown above, you can see they provide a close approximation of the final framed product shown here. 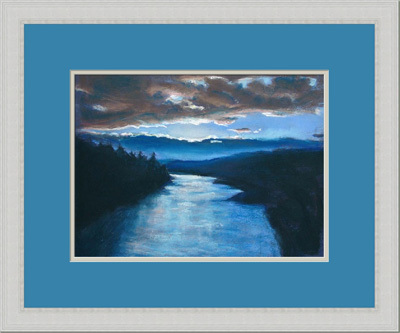 This pastel was created by Gretchen St Lawrence and is currently on display at the Art Under the Sun Gallery in Floyd, Virginia. 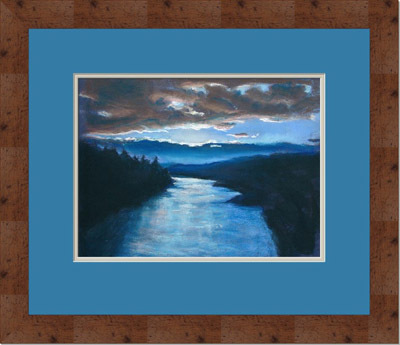 This entry was posted in Basic Business Concepts and tagged Art Under the Sun, custom picture framing, Floyd Virginia, Gretchen St Lawrence, Visualization software. Bookmark the permalink.